Sign-in locations at Miller Park (South of Klement's Sausage Haus), Stormwater Park (across from Palermos Pizza), and 68th & Dickinson St.
Held near Earth Day each year, our Earth Day Clean-Up plays a major part in the environmental restoration of the Trail. The annual program is a collaborative effort with Milwaukee Riverkeeper, Keep Greater Milwaukee Beautiful and Menomonee Valley Partners. Register on the Riverkeepers website. This lets us plan for how many supplies to have at each site, but we will never turn you away if you just show up! Last year was a huge success, drawing close to 300 eager volunteers, including participants from surrounding neighborhoods, Cargill, Kelmann Corp, Marquette University, The Sigma Group, Joy Global, FOHAST, the Sierra Club, Girl Scouts, Trout Unlimted, Toshiba America Energy Systems Corporation and several other organizations. Thanks to all who made it a very good day! Join us for our Inaugural Hank Aaron State Trail Spring Ride to celebrate Spring and the opening of the West End of the Trail! We will gather at the Menomonee Valley Community Park at the corner of W Canal Street and W Milwaukee Road. We'll hear a few brief words about the Trail and an exciting new artistic landmark planned for this very location - People of the Road. People of the Road is a five-sculpture public artwork that will honor and celebrate the thousands of workers who built the locomotives and rail cars made in Milwaukee. It will be a powerful reminder of the role the Milwaukee Road and their employees played in the history of Milwaukee and beyond. We'll then will hop on our bikes and ride on the recently reopened trail and explore the west end until we arrive at 124th Street for a celebratory toast. We will then return to Third Space Brewing in the Menomonee Valley for libations and good company. The ride is 6 miles one way. It will take about 40 mins at a casual pace. Roundtrip is 12 miles. 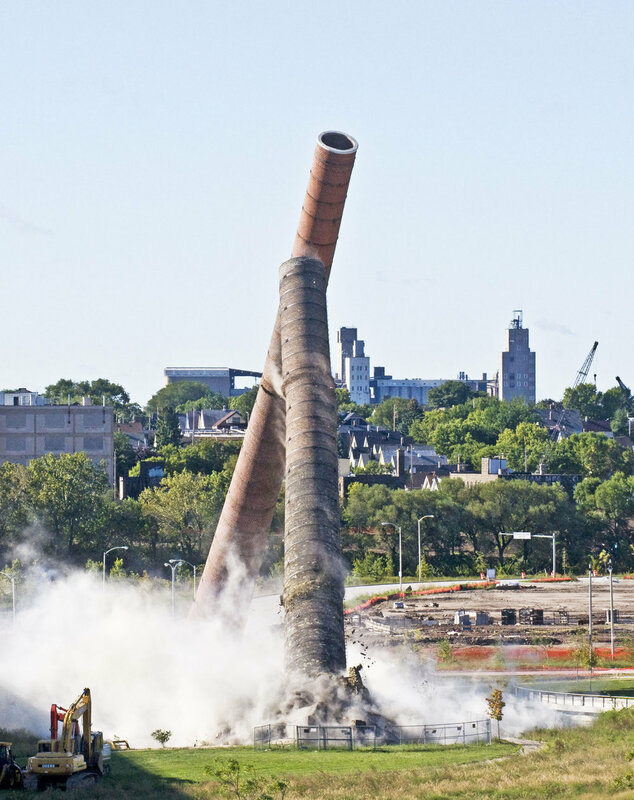 After the rail shops closed in 1985, the site rapidly deteriorated until 2010 when the last vestiges of the Milwaukee Road, the chimneys, were demolished due to structural issues and concern for public safety. There is no longer a visual reminder of the hardworking men and women of the Milwaukee Road. Until now! Learn more about People of the Road. Walk the Hank - Going West? The Trail will take you there. The western extension of the Hank Aaron State Trail was completed and opened to the public in November 2018. Join us on a walk to learn about the completion of the trail, view the fabulous new mural at Kelmann Restoration, and explore the newest connection to the Oak Leaf Trail, Deer Creek Trail, and other trail systems in Milwaukee and Waukesha County! Summit Players Theatre's highly-popular Shakespeare in the State Parks program returns in 2019 with one of the Bard's most well-known plays: Romeo and Juliet. We are pleased to welcome this fabulous production once again in Three Bridges Park along the Hank Aaron state Trail near 33rd Ct (south side of the river). Take a beautiful guided tour of the Hank Aaron State Trail and Milwaukee Soldiers Home Grounds. We will use the Trail to walk to and through the nationally recognized Historic Soldier’s Home Campus, established at the end of the Civil War as a place of healing and respite for soldiers. You won’t want to miss this up close look at the great Gothic tower now on the Historic Registry! The 2019 Run/Walk route takes you through beautiful Three Bridges Park crossing the Menomonee River, through restored prairie and provides a dramatic view of Miller Park in the home stretch. This route is steeped in history and located along Milwaukee's former rail and industrial corridor. The transformation of this area over the past 20 years is worth visiting over and over again. Come out to support the Hank Aaron State Trail and enjoy the beautiful route. Stick around to enjoy the live band, food, silent auction, and prizes galore! Arguably, one of Milwaukee's best events all summer long! Beautifully landscaped, this walk leads us around the Harley-Davidson Museum's peninsula to the Sixth Street Bridge and into Reed Street Yards, a development focusing on water related businesses. Celebrate cycling with us at Wheel & Sprocket's 35th annual Bike Expo Sale at Wisconsin State Fair Park, April 4-7th. This is the Largest Bike Sale in the Nation. The Bike Expo Sale is the kickoff to spring and the cycling season! Stop by our booth to say hello and learn what’s new and exciting with the Trail. We’ve got lots of fun events planned for our 20th Anniversary. Learn more about the event, people to pedal with, places to explore, and reasons to rides that will make 2019 your year for cycling! Admission is FREE so come on down and bring your friends! Bundle up and experience an exciting winter adventure! In light of the forecast of freezing rain, we are modifying plans for the event to keep everyone safe, warm, and to ensure we all still have a GREAT time! ALL outdoor activities will be moved indoors to Urban Ecology Center, Escuela Verde Milwaukee, and Velobahn Coffee & Cycle (All located on West Pierce St. between 36th and 37th St). All are welcome to join us at the FOHAST Annual Meeting. Hear what we've been up to, what we have up our sleeves with our upcoming 20th Anniversary, and maybe even see how you can get involved on one of our many committees that keep the Trail an active and vibrant place in our community. The salmon run in the Menomonee River from late September to early October. Join the anglers in the river or view the salmon run from Three Bridges Park west to Miller Park. View the salmon from the riverbank or from the 33rd Court Bridge or Valley Passage Bridge in Three Bridges Park. Bring your own bike, helmet, and water. There is no cost for this tour. Spend a family-friendly morning learning about the Menomonee River, fish you can find here, and techniques that could lead you to the big one. This event occurs around the annual fall salmon run and we could see dozens of salmon swimming upstream to spawn. Come cast a line with us! The Hank Aaron State Trail goes through areas rich with history, little known facts, and innovative creations. Join Trail Manager, Melissa Cook for a pleasant walk and story sharing in a new location each month during the summer. Art along the trail such as our current project, the Milwaukee Road Monument. The Summit Players present their 2018 season: a brand-new production of Shakespeare's Twelfth Night will visit 17 different Wisconsin State Parks this summer. We are pleased to welcome this fabulous production once again in Three Bridges Park along the Hank Aaron state Trail near 33rd Ct (south side of the river). Come and enjoy Shakespeare in this beautiful natural setting! Visit the Wisconsin Bike Fed to see all of the Wisconsin Bike Week events! Held near Earth Day each year, the Earth Day Clean-Up plays a major part in the environmental restoration of the Trail. Fishing for steelhead, also known as rainbow trout, can be one of the most exciting of Wisconsin’s many angling opportunities - and some the best time for steelhead fishing or viewing the steelhead run arrives around April. Great viewing locations along the Hank Aaron State Trail are from Three Bridges Park west to Miller Park, either from the riverbank or from one of the bridges in Three Bridges Park.